For patients with advanced kidney disease, Hemodialysis is a life-saving process of renal replacement therapy, used to replace kidney functioning that has been compromised or lost. The Hemodialysis devices imitate the way the damaged or impaired kidneys are supposed to work, taking over their job of cleaning the blood of waste products and excess solutes, while restoring the essential solutes in the blood to an acceptable level. 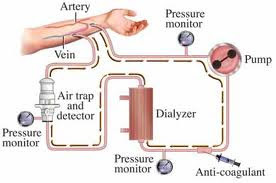 The dialysis system pumps purified water and electrolytes through tubes to the dialyzer. The waste products are removed by the Hemodialysis system and an electronic detector monitors the outgoing liquid for possible blood seepage. During the process, the patient's blood is cleaned of waste and excess water. The waste products from the patient's blood pass through a semi- permeable membrane into the dialysis fluid. It is a diffusive process maintained by a constant state of unequal levels of solute concentrate, and waste products are removed from the blood and refilled from the elecrolytes in the dialysis fluid. An internal computer is built into the Hemodialysis system, which facilitates the blood and dialysis fluid delivery systems to deliver the necessary amount, and for the treatment to be monitored. Alarms go off to alert the healthcare professional or patient to check the system if adjustment is required. An integrated microprocessor also allows treatment data to be recorded and stored for observation purposes. Hemodialysis machines are built specially to be protected from extreme temperatures, spilled liquid, leakage, power interruptions, etc. Home Hemodialysis encourages independence as self-care/ independent care means patients are taking responsibility for their own health by becoming dedicated to a healthy lifestyle and avoiding illness, commonly pertinent to the management of long-term or serious medical conditions. Self-care Hemodialysis does not have to be essentially carried out in the patient's home as renal centers and satellite units enable patients to self-manage their treatment in centers with support, with clinical assistance available, if needed. To carry out Hemodialysis at home, the patient and/or a helper or spouse learns to use the system, take an accurate blood pressure reading, and to replace needles and attach the dialysis lines independently, as necessary. Doing Hemodialysis at home offers a large number of advantages, including more flexibility to tailor the dialysis regimen by changing timing or length of sessions, making it easier for the patient to lead a normal life. Home-based Hemodialysis is also more cost-effective than hospital treatment and improves the quality-of-life of the patients, allowing them more independence and empowering their choices. Before home Hemodialysis is considered, it is important to carefully explore the patient’s home environment and if there is suitable space for the equipment near the main water and drainage area of the house. The water pressure and quality also must be within suitable limits. All electrical wiring must be checked and other conditions in the home may need updating. Patient/Hemodialysis machine interaction is an important consideration. Home Hemodialysis machines have a number of options which enable the patient to more easily more easily use the machine, such as height and positioning. Making sure the Hemodialysis patient is aware of all support systems available will strengthen their ability to trust that they can take care of their own healthcare needs as much as possible, so they can be independent and live a full and fulfilling life.